Considering where we are on this road to independence, the most difficult task we currently face is not winning a referendum but getting the chance to win one. Theresa May has infamously told us, and continues to tell us, ‘now is not the time’. So when is? If we want this dancing queen to start moving to our tune, we need to have enough people playing it. We need to give Nicola Sturgeon a (democratic) hammer from the Scots with which to tell Theresa ‘now is the time’. So how do we do this? The research sponsored by the Scottish Independence Convention (SIC) presented at last year’s Build conference concluded ‘If the Scottish independence movement wants to get to where it wants to go, it must know where it is now and what the path to success looks like.’ That holds true today and will hold true until just after the polls close on our final, successful, referendum. The SIC is made up of Scotland’s national independence supporting groups (plus many more local ones represented via regional forums), as well the main independence supporting political parties. The SIC has, as part of its work preparing for the next referendum, continued to sponsor voter research. The focus of this has been on developing an ever-deeper understanding of where the voters are on their path to Yes and critically, how can we help voters along it? In the last year, we have conducted research to develop profiles of important voter groups- those who intend to vote for independence, those who intend to vote against, and more importantly, those who say they currently don’t know. Another vital group we have been trying to understand are those who have swapped sides since last time. We have also begun testing what types of message (and message structures) best persuade the Don’t Knows, the soft No’s and those who have swapped sides, to change their minds, or at the very least, what encourages them to reconsider independence. For what comes next in this article, it is vital to understand that whilst we recently conducted a survey of 1500 people weighted to represent the Scottish population, it was not designed to be an opinion poll. Such polls, conducted by companies like YouGov or Survation, aim to accurately measure voting intentions across the population and to highlight differences between groups (typically based on age, gender, occupation or geography). Instead, our aim was to examine if and why people have changed sides and what types of independence supporting messages create positive emotions, change people’s minds and influence their voting intentions. Whilst our research is able to give a good picture of how Scotland intends to vote, it gives a laser sharp picture of whose voting intentions are changing and how they can be influenced. It is also research which a national campaign organisation, such as the one proposed by SIC, can use to help set the agenda, change the story and get people to look again at independence. Considering this wider purpose, please forgive us if we don’t tell you all the exact details – our opponents are reading this too! So in the year since the update given at the ‘Build’ conference, where are the voters now on their journey, and what does the path to success look like? By asking people how they voted last time and their intentions in the future, we find strong movement toward Yes with the largest movement seen in women under 34. More women now support Yes than No, though overall a majority do not yet support independence. This is because of the high number of women stating they don’t know how they’d vote. Encouraging certainly, but much is still to do in order persuade the Don’t knows and turn the Yes’s into actual votes. Our support still drops off in the older age categories, but now more voters up to the age of 55 support independence than are against it. A majority of voters interviewed want a referendum before the 2021 Scottish elections, including a clear majority of Don’t Knows. We find strong movement toward Yes when we ask people how they voted last time and their future intentions. This movement is most marked in women under the age of 44. Brexit is starting to have an effect, particularly in the young and particularly in young women, with women under 34 saying it is having the strongest effect on their intention to vote for independence. The Don’t Knows look more like Yes supporters than No supporters, both in terms of their age, gender and occupation but also in their psychological make up, such as how confident they are in Scotland’s ability to solve the challenges independence will bring. We now know the types of message that persuade ‘don’t knows’ to re-engage with the arguments for Independence and that persuade them to change their minds. Why? Well a year ago our participants told us that Brexit wasn’t having an effect but expected it would. We are now seeing its effect, and again this is strongest in younger women (under 34). It is also pulling women aged between 35 and 54, and men up to the age of 64, towards independence. It is vital we find out exactly why Brexit is having this effect on younger women and discover the deeper reasons behind their journeys to Yes. It is also having a strong effect on voters in high managerial/ professional occupations and those who are unemployed. Brexit is moving both these groups toward independence, though the former are not there yet. Just as some folks have moved toward Yes, some have moved away. When we examined where they moved to, we found that more moved to don’t know, than to No. However, the same is not true for our opponents who lost more of their voters to Yes than to Don’t Know. Those who couldn’t vote last time are coming to us 2:1. When you compare the demographics (age, gender, occupation) of current Yes, No and Don’t Knows, the Don’t Knows look more like independence supporters than they do No supporters. We also profiled voters on their psychological make-up, such as their attitude to risk and how good they think they are – and how good they think the people living in Scotland are – at solving problems. Proponents of independence are canny about taking risks and can be classified as ‘risk averse’. No supporters, however, have significantly higher levels of risk aversion. Our supporters have more confidence in themselves, and us as a collective, to solve the problems independence will bring. When we look at Don’t Knows on these measures, they are also psychologically more like independence supporters than No supporters. A year ago, people were not ready to listen again. Very little had been done actively at a national level in Scotland to change minds, and life after 9 years of Tory austerity was (and is) hard. People were left with little energy for politics and referenda as neither seemed to solve anything. Now some are ready to listen, enough in fact, to take us from borderline 50% to comfortably above. So rather than just relying on Theresa May and Brexit to move people towards support for independence, what can we do? Instead of testing finished messages designed to persuade different groups, we primarily tested different forms of message. We tested the type of hope they should portray and whether there should be an element of fear? Should we be explicit or just imply the benefits independence can, will or may (we tested these words too) bring? We found very strong, nearly off-the-charts, results for a particular type of message and message structure (i.e. the way it was worded and what it focused on) that made Don’t Knows feel hope and made them more likely to change their minds about voting for independence. It is a message structure that is positive, confident without being over confident, and has a wee touch of steel in it. Crucially, we also asked respondents if the messages shown to them led them to reconsider arguments for independence. The message structure for achieving this is the same as the message structure motivating people to vote Yes. But the focus of the messages is very different. The message leading people to reconsider independence most effectively, promoted the idea that Scotland ‘needs its own currency to truly control its economy’. We have to be careful about repeating messages that Don’t Knows did not engage with last time. They want something more concrete with specific examples. The responses to messages on the economy suggests they are interested in listening to our alternative progressive view. Perhaps Brexit has finally shown that the UK cannot be trusted to run our economy, if we want an economy that focuses on the wellbeing of all of us? From this, we know we have a very good idea about what types of messages people find more hopeful, which format they like more, agree with more and which general topics have more impact. It also highlights that people at different points of their journey need to be spoken to differently and about different issues. So then, where are we now? More women have joined us, younger women in particular. Our movement is still oriented to the younger than those over 65 and contains voters who are more hopeful, and more confident in the abilities of people who live in Scotland. Brexit is now having an effect. Don’t Knows look more like us both in terms of their demographic and psychological profile, and we’ve lost more to this group than we did to No. We need to keep working to understand how to help this group join us again. There are the 30% of British Nationalists who will just sap our energy if we try to change their minds. Let’s just smile, remind them that we are all Jock Tamson’s bairn’s and move on. We need to ensure we are not complacent about those whose jobs put them in the ‘semi-skilled’ and ‘skilled manual’ workers’ categories. People here still support us more than No, but a relatively high number of these folk say they don’t know how they will vote. We also need to do more in the ‘lower supervisor, administrative and professional’ category – again, many don’t know how they’d vote. The retired are still not coming to us. To continue to understand where we are heading, we need to continue this research work; delving deeper and exploring more why women are coming to us. And we need to sharpen further the types of messages and their specific context. We need to stay alert to detect if the Brexit effect starts to taper off and people get used to the idea. So Mrs May, even with the chaos your party is creating over Brexit, now still isn’t the time, but it is coming soon. With every shambolic headline undermining Brand Britain and the belief that it represents a strong and stable economy, it is getting closer. Our movement is getting larger and now we know even more about how to encourage people to join us. 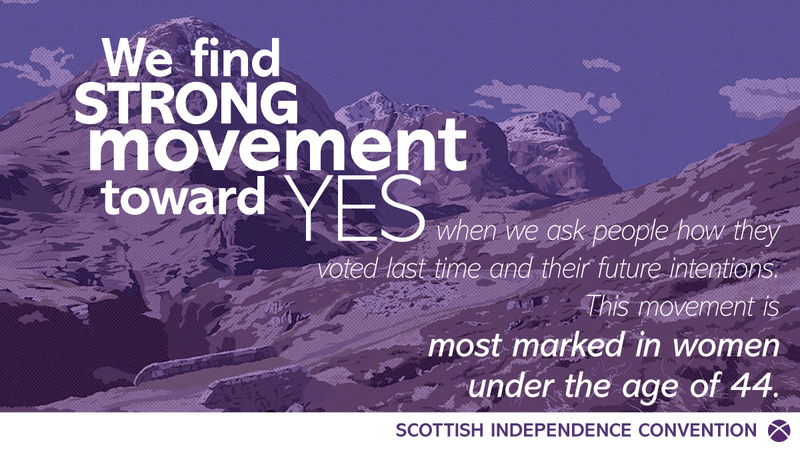 The Scottish Independence Convention believes now is the time for a national campaign group. One that can hone our understanding further and is able to help build our movement even further. So when Nicola next goes to see Theresa May, our voice cannot be ignored because it represents the will of the clear majority of the Scottish people.